The Armed Forces of the Philippines (AFP) spoiled the plan of the New People’s Army (NPA) to conduct harassment at the Jalaur River Multi-Purpose Project (JRMP) II in Calinog town, Iloilo yesterday. This, after the Philippine Army’s 61st Infantry Battalion (IB) encountered around 10 rebels at Masaroy village, Calinog yesterdayday morning. “They seem to harass and plan the destruction of our equipment (at the JRMP site). This we see as one of their purposes,” said Lt. Col. Joel Benedict Batara, 61st IB commander, said. He said they received information about the plans of the rebels to conduct ambush and burning of equipment at the mega-dam site. Batara said the encounter site, which is considered the rebels “staging area” before conducting harassment and attacks, is more or less 10 to 15 kilometers from the JRMP II located at Agcalaga village, Calinog. The Army regards the JRMP II as always under imminent danger “because the NPAs are experts of deception”. He assured the government has enough forces from both the AFP and the Philippine National Police (PNP) to secure the biggest dam project outside Luzon. The P11.2-billion JRMP II held its ceremonial groundbreaking on February 27. Batara also assured that government installations like the Panay River Basin Integrated Development Project in Capiz province and other government projects are also secured against rebels. The encounter on yesterday led to the capture of one of regular NPA members. Batara said alias “Fernan”, who is under the custody of the Calinog Municipal Police, is currently under interrogation. 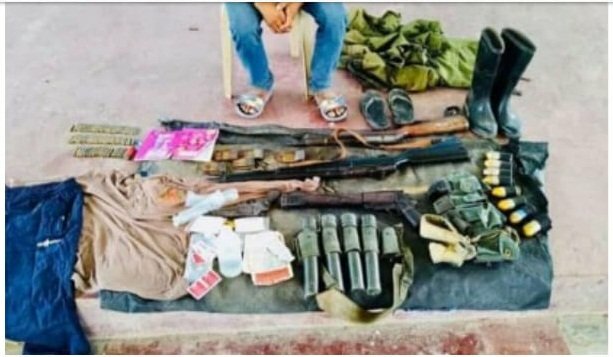 Recovered in the encounter site were one 30-caliber Garand rifle, one M79 grenade launcher, a 12-gauge shotgun, caliber .38 revolver, eight rounds of 40mm live ammunition, four rifle grenades, bandolier, subversive documents and medical paraphernalia. “We hope to get more information from Fernan. He is under the custody of the police and will definitely be charged with illegal possession of firearms,” Batara said. The rebels withdrew and fled northeast towards Capiz province. Batara said no casualties were reported from the government side. The Army assured its security operations will continue this Holy Week “because rebels are conducting atrocities, thinking government troops are unprepared”.